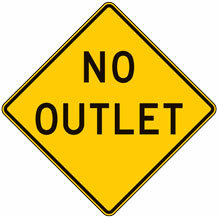 Click on the icons below to learn more about signs and mounting systems. What Signs Ship the Fastest? CPC has a large stock program with MUTCD Compliant products available for quick shipment. Look for the Quick Ship icon when choosing products. Call customer service at 1-800-367-1492 for assistance with expedited shipments or for help meeting specific deadlines. Not all traffic signs and sign faces are created equal. 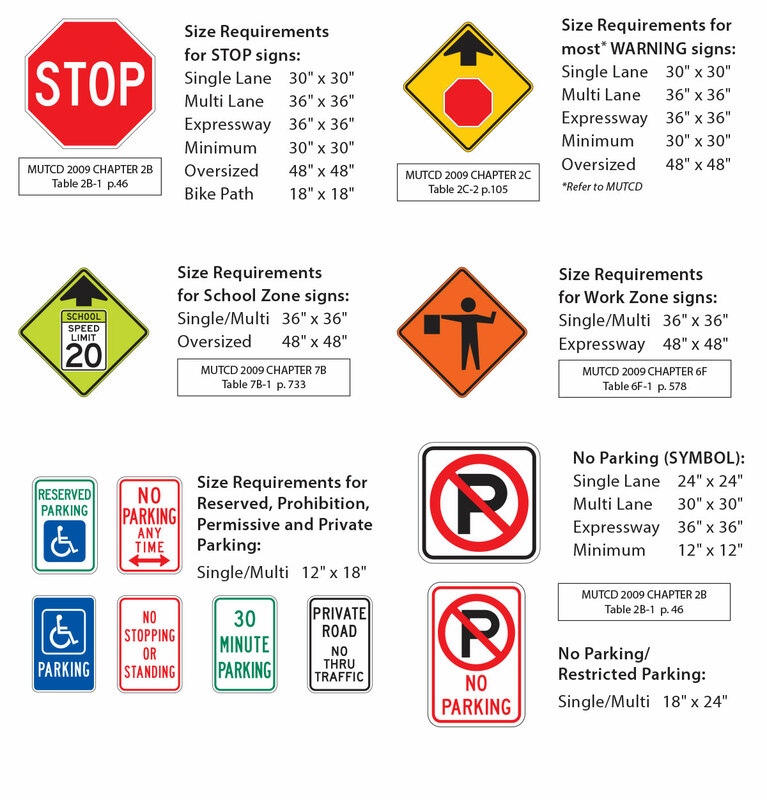 In the emerging world of digital printing in the traffic sign industry, safety and MUTCD compliancy remain priority.Custom Products utilizes the 3M MCS Matched Component System for all digitally printed traffic and screen printed signs. The use of 3M's Matched Component System insures your investment. 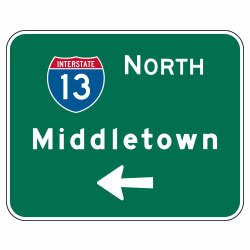 When signs are created with high quality 3M sheeting and components, the sign performance is backed by 3M warranties. The MCS guarantees that signs will remain effective for their intended use and meet minimum values for retro-reflection for the specified warranty period. The components of a digitally printed or screen printed sign are critical to the warranty, MUTCD compliancy and quality of the sign. Components MUST come from a single manufacturer's system and Shall NOT be mixed. 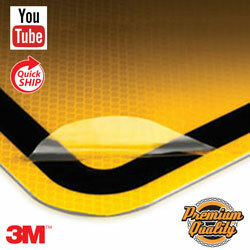 NOTE: The use of any non-3M materials in conjunction with 3M products will void all warranties. 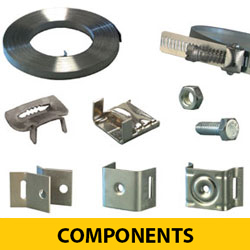 Nylon Washers are required to maintain warranty when twist style fasteners are used to mount signs sheeted with Matched Component System Materials. 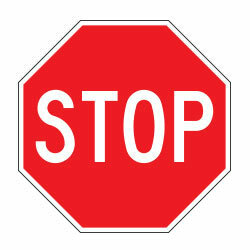 Beware of imposters and protect your investment by purchasing fabricated signs that are 3M certified for authenticity. Custom Products is pleased to be a member of the 3M Certified Sign Fabricator Program since the inception. We have demonstrated that our people, aluminum substrate, shipping techniques, and equipment are capable of manufacturing signage by every imaging technique to meet 3M’s strict Matched Component Systems (MCS) warranty standards. This includes the newest technique, digital printing and ultra violet (UV) light protecting signs on a very high end printer that is authorized by 3M and capable of printing every traffic sign color plus PMS colors. Finally, we continue to demonstrate that our Sales Force and Marketing information are capable of guiding customers through the complex maze of Federal, State, and Local standards that govern the Traffic Devices industry. Beware of wasting valuable funds on imposter signs that fade out quickly. Are Your Signs Bright Enough? 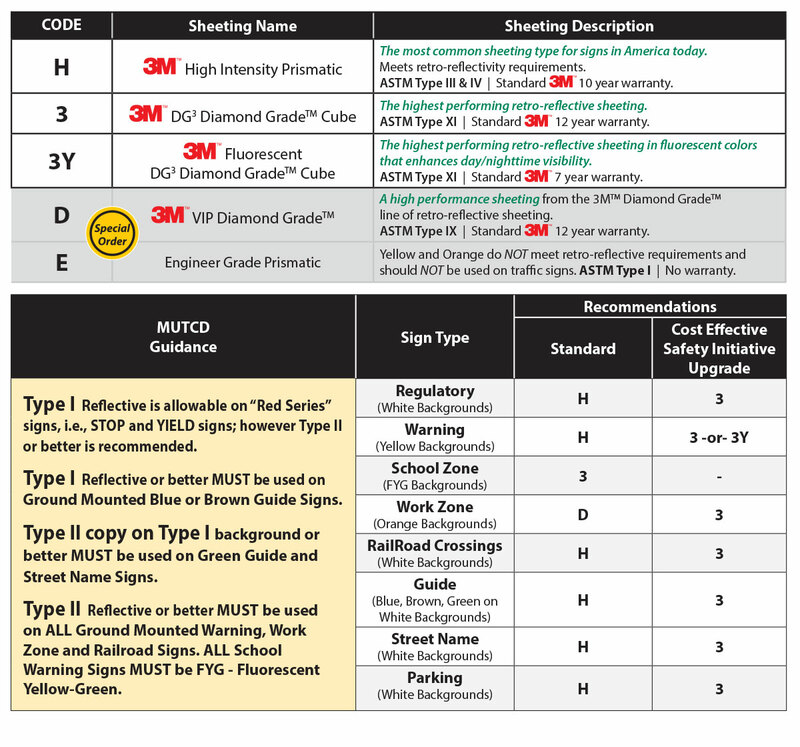 See the charts below for information on 3M Retro-Reflective Sheeting types and recommendations that considers MUTCD Compliance, Safety, and Budget Factors. or call customer service at 1-800-367-1492 for the most current information. Regulatory Signs are important to maintain as the absence of, or damage to, could quickly result in or contribute to a severe crash. Damaged or missing regulatory signs should be replaced or repaired within hours of the agency having notice of them missing, down or damaged. Work Zone Signs should only be used in "new" or "like new" condition and replaced immediately if missing, damaged or deteriorated. 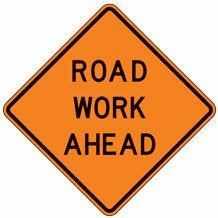 While they are temporary signs, condition is extremely critical because travel through work zones can be hazardous with unexpected or unusual conditions. Warning Signs that are damaged or missing should be replaced or repaired within 3 working days of the agency having notice of them missing, down or damaged. Some signs may warrant faster replacement based on nature of sign. 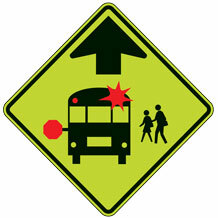 School Zone Signs that are damaged or missing should be replaced or repaired within 3 working days of the agency having notice of them missing, down or damaged. Some signs may warrant faster replacement based on nature of sign. Guide Signs that are damaged or missing should be replaced or repaired within 7 working days of the agency having notice of them missing, down or damaged. Some signs may warrant faster replacement based on nature of sign. Going Green: Did You Know? Prismatic Reflective Sheeting Advances in both manufacturing processes and on-the-road performance of reflective sheeting have resulted in a win-win situation for the traffic safety industry with brighter signs and the use of less precious resources. Aluminum Alloy 3105 Specifying the environmentally friendly Alloy Grade 3105 for signs and sign blanks over the traditional alloy 5052 can significantly improve the environment and saves resources which translates into savings making their way to your sign budget! Aluminum Conversion Coating Regulations restricting or banning chromium conversion coats have prompted the metal finishing industry to develop non hexavalent chrome conversion coating technologies which are known to be more environmentally friendly and provide increased human safety during the manufacturing process. U-Channel Posts Manufactured using recycled train tracks (T-Rails) purchased and rolled in the USA meeting ASTM requirements. Powder Coating The benefits of powder coating for consumers are simple: powder coating is the most attractive, durable, and is a high-quality finish. Powder coating will make your purchase look better and last longer compared to wet paints - not to mention its reduced environmental footprint! Since, powder paint has no solvents (VOC's), it has a drastically reduced environmental impact and increases worker safety! Going Green Custom Products manufactures delineators, post reflectors, post anchors, sign savers, no trespassing signs, and other items out of scrap material in an effort to be “greener” and create less waste. NOTE: 500 lb. minimum required. Call Customer Service at 1-800-367-1492 for program details. Matching custom branded signage is available for parking facilities, parking areas, businesses, buildings and entrances. Also available are custom branded guide signage including wayfinding, metro street name signs, city entrance guide signs and ground mounted street name signs. Call Customer Service at 1-800-367-1492 for personalized design help with your signage. Many of the sign legends that we offer can be upgraded to Level 2 and Level 3 signage as shown below for relatively little additional cost provided you have vector artwork for your logo. Regulatory, Warning, and Construction Work Zone legends may not be altered but most others can. Call Customer Service at 1-800-367-1492 for details. CPC provides numerous Finishing Services for signs and decals including Graffiti Film, Sign Dating Stickers, and Hinges for Traffic Signs. Add protective overlay film to effectively reduce the effects of graffiti and sticker damage. 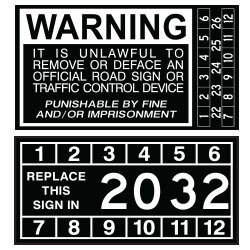 Sign Dating Stickers are a cost effective assessment method for sign retroreflectivity. 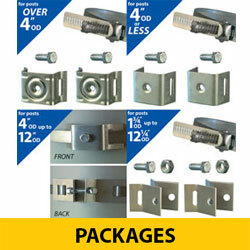 Aluminum face mounted hinges that allow the sign to be folded when not in use. IMPORTANT NOTE: Colors vary from screen to screen and the color of product images should not be used to choose product options or colors.